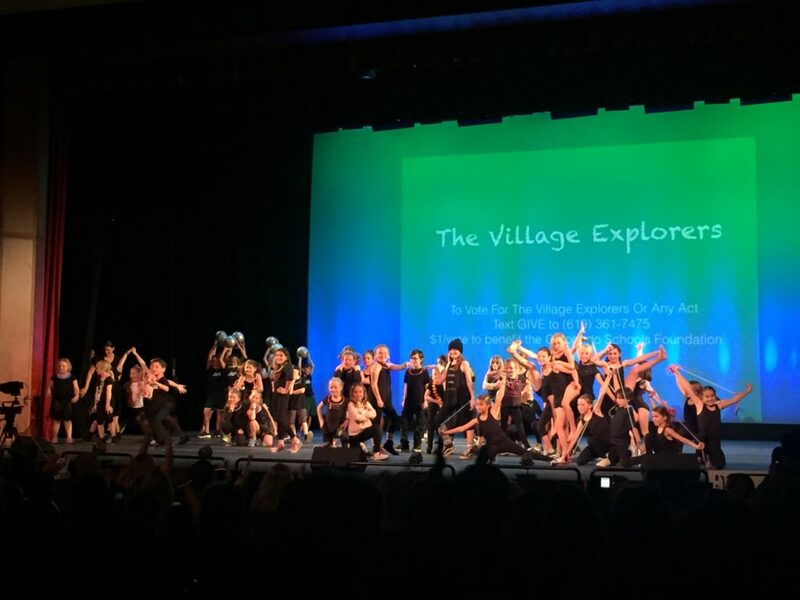 On March 2, 2017 the first Coronado’s Got Talent, created by Alan Kinzel of Teles Properties, premiered with a line-up of twenty-six acts performing in front of an audience of 600 people. While it was indeed a thrill seeing just how talented the community is, the most impressive feat of the evening was the fact that all of the net proceeds went directly to the Coronado Schools Foundation, making all of Coronado’s students the big winners! 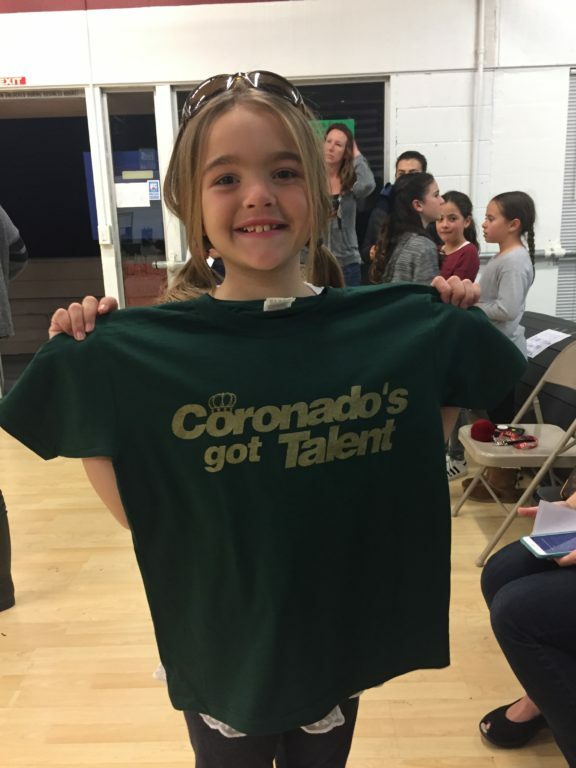 Each person who auditioned for the show received a Coronado’s Got Talent T-shirt regardless of whether he or she was selected for the live show. In early February auditions were held at the Coronado Training Center, and over seventy acts vied for spots in the live show. While Kinzel would have loved it if he could include everyone, time constraints for the live show, of course, made it necessary to pare down the list. Everyone who auditioned received a complimentary Coronado’s Got Talent T-shirt, a gesture that set the tone for the type of talent show Kinzel wanted – one that celebrated a spirit of inclusion and a true sense of community. Some of the people who tried out were quite nervous, but Kinzel and his team of audition judges made applicants feel welcome, and put them at ease with their warm smiles and encouragement. Auditions were held in early February at the Coronado Training Center. Prior to the live show on March 2nd, performers were invited to walk the red carpet, giving the evening a true Hollywood feel. Even though the show didn’t start until 7:00 pm, people were lined up outside the doors of the Coronado High School Theater well over an hour and half before the show even began! People who hadn’t purchased tickets online in advance added their names to a waiting list just in case there happened to be any last minute changes that would allow them the opportunity to watch the sold out event. 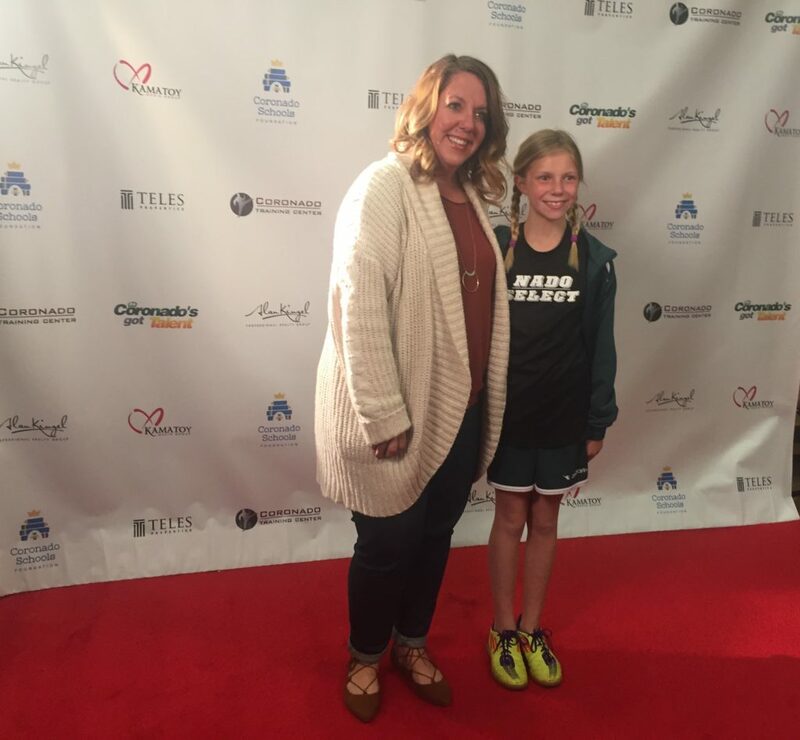 4th grader Libby Schiaffino, who showed off her soccer skills in Village Elementary’s group act, walked the red carpet with her mom Amy. Emcee Larry Delrose at the Coronado’s Got Talent auditions in early February. 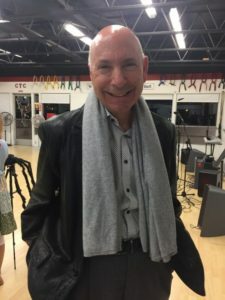 The charismatic Larry Delrose, described as “a well known real estate investor/financier who turned actor, film producer, writer, singer, and storyteller,” was the emcee of the live show. He did a phenomenal job engaging the performers and getting feedback on each act from the judges, the whole time injecting bits of humor to calm the nerves of those on stage. Both the live show audience as well as the live stream audience were able to vote for their favorite performances. For just $1.00 per vote, fans could text GIVE to a local number, and all 3,000 of those texted votes also directly went to the Coronado Schools Foundation. 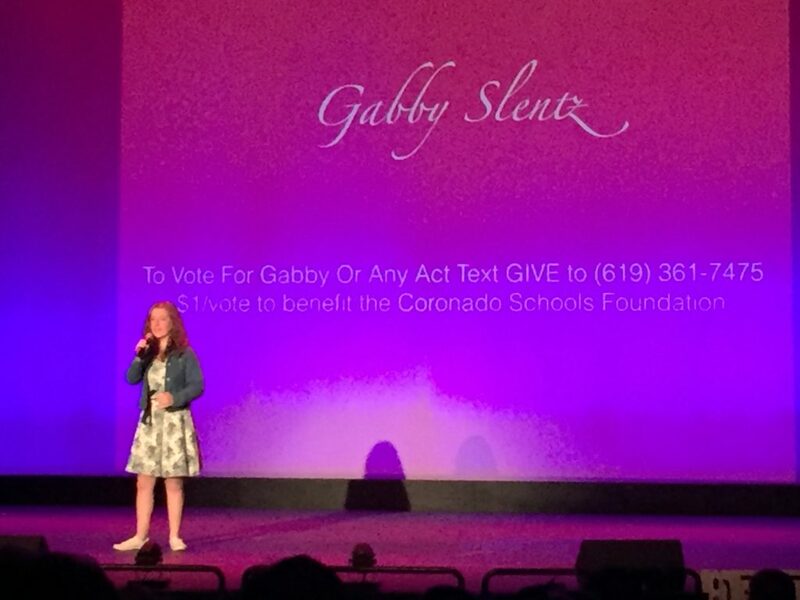 At the conclusion of the show, Gabby Slentz was awarded “Fan Favorite” after receiving the most texted votes. Gabby, a Coronado High School student whose military family recently moved here, wowed the crowd with her powerful voice as she sang. Fan Favorite Award went to Gabby Slentz. 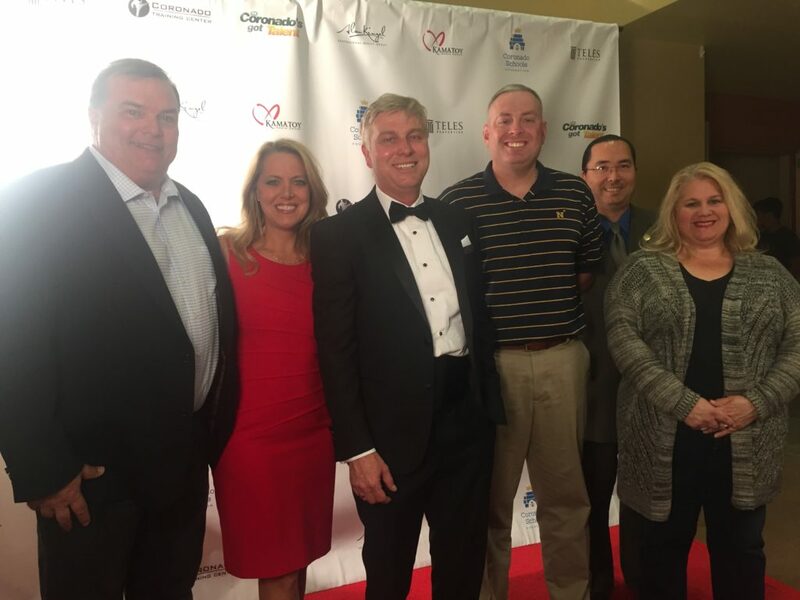 Judge Dan Boyle, Judge Melissa d’Arabian, Event Creator Alan Kinzel, Judge Michael Cornelius, Judge Casey Tanaka, and Judge Linda Kullman on the red carpet before Coronado’s Got Talent began. 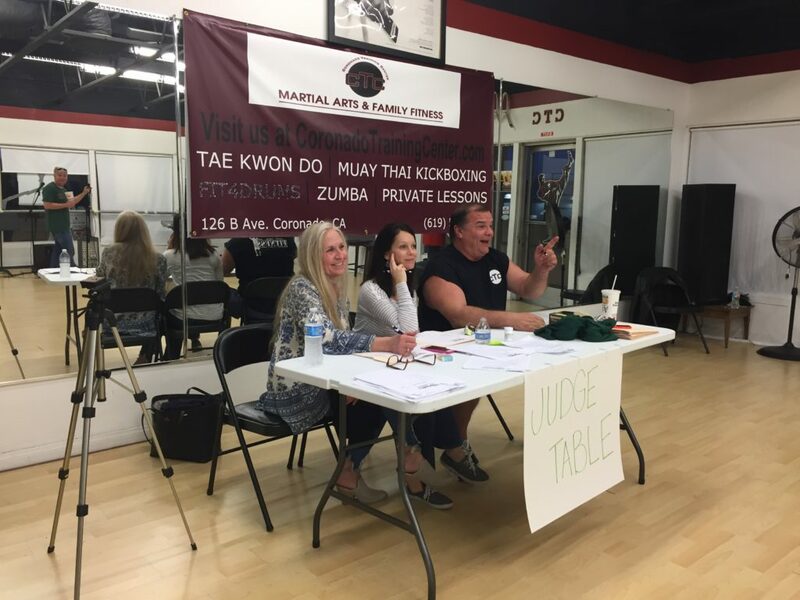 Unlike reality TV talent shows, where judges sometimes offer abrasive commentary, all of Coronado’s Got Talent judges only offered words of inspiration, praise, and genuine respect for each act that graced the stage. It was evident that the judges were just as blown away by the talent as the crowd was. 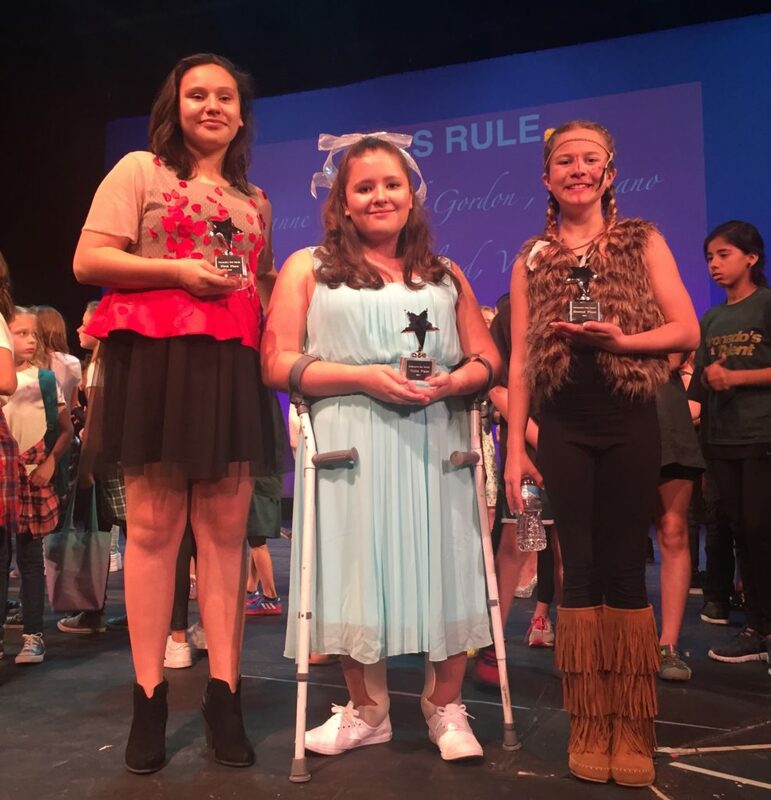 Melissa d’Arabian gushed over fourth grader Katie Moreno’s I Dreamed a Dream from Broadway’s Les Misérables, telling Katie her performance brought to mind Teddy Roosevelt’s famous speech The Man in the Arena because she was so impressed with Katie’s bravery. 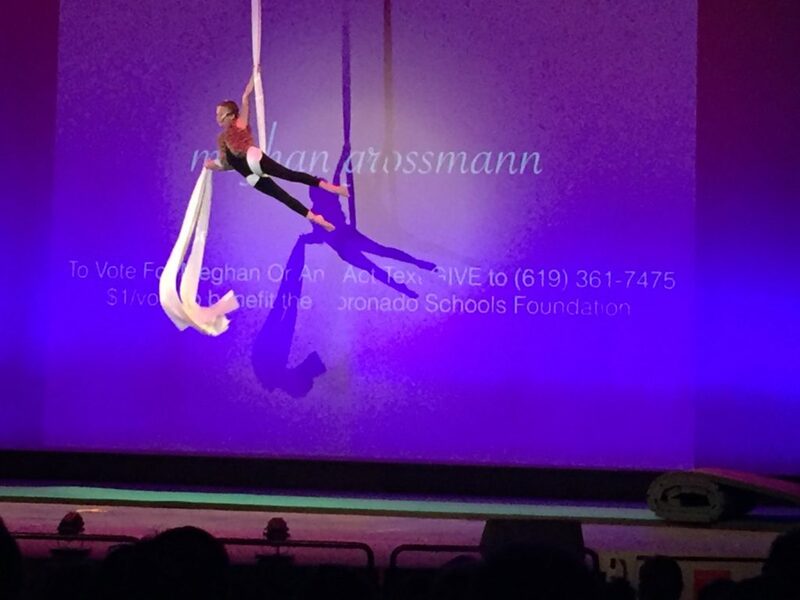 While the majority of the acts were vocal performances, there were also some rather surprising talents showcased including Ian Crozier’s yo-yo act, Meghan Grossman’s aerial dancing, and Alex Hurlburt’s jump roping. Several of the acts featured instrumental performances, including a band called The Voyagers, Patricia Fernandez, Keith Prentiss, Melanie Johnson, Kendall Gallo, Bella Grace, Michael Becker, and Lizzy Cameron. The H2A Dance Team Junior and the H2A Dance Team Teen impressed the crowd with their hip-hop moves, and the Silver Strand Dance Crew also showed off their fancy footwork. The vocal performances offered such an eclectic mix from Patricia Fernandez’s Celine Dion hit Power of Love to professor of finance Michael Ladd’s operatic performance. The crowd’s faces all lit up as Ladd began to sing because just from looking at him one would never be able to guess that such an impassioned and deep voice could loom! Signe Shinn brought Italian singer Andrea Bocelli’s music to the stage while military spouse Nicole Dowd brought country singer Loretta Lynn’s hit song You Ain’t Woman Enough to life. Amanda Fink sang Amy Winehouse’s You Know I’m No Good and Natalie Lusitana sang one of Disney’s most popular tunes ever, Let It Go, from the hit film Frozen. The variety of musical genres was further highlighted by Village Elementary student Luke Cantrell’s performance of Stitches, a popular hit by Shawn Mendes, contrasted with Keith Prentiss’s acoustic guitar take of the rock song Sweet Child of Mine by Guns and Roses. 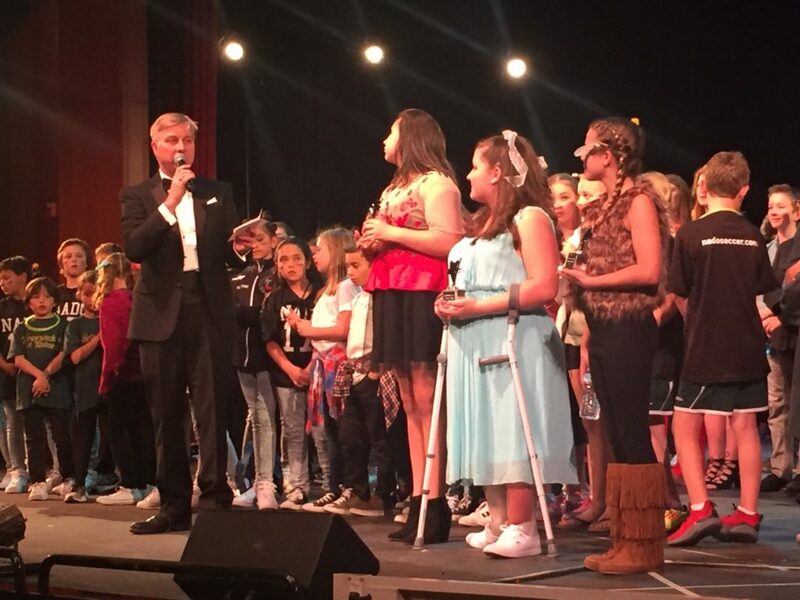 The majority of the vocal performances, whether they were renditions of songs known and loved for decades or new favorites, were songs that were familiar, but a few of Coronado’s Got Talent performers showcased songs that they wrote themselves. Talk about a truly talented group! Don’t be surprised if you someday hear that Coronado singer-songwriters Kendall Gallo, Lizzy Cameron, Bella Grace, and Melanie Johnson are walking the red carpet at the Grammy Awards! Each of their songs, while different in its own way, touched the hearts of those in the audience. JJ and the Juke Joints was the only one of the twenty-six acts listed in the program that did not perform. JJ, a 43 year old active duty sailor, was unfortunately unable to make it to the live show performance because his Navy schedule kept him away from Coronado the night of March 2nd, but, just like all of the other acts, a brief background video which included pictures as well as biographical information, was still shown. Emcee Larry Delrose acknowledged that JJ wasn’t able to attend, and encouraged the crowd to stand for a few seconds and give a round of applause for JJ as well as all other active duty service members. JJ’s absence, while disappointing, was certainly a powerful reminder that Coronado is indeed a military town. While the audience waited patiently for the results, a trio known as Girl Power (Carly Copeland-Gordon, Lily Evans, and Swaran Jouhal) entertained the anxious crowd with a final song. As he closed the show for the evening, event producer Alan Kinzel declared, “Everyone’s a winner,” and those in the audience agreed wholeheartedly. The inaugural Coronado’t Got Talent brought the community together for a good cause as it celebrated the plethora of hidden talents in the Crown City. 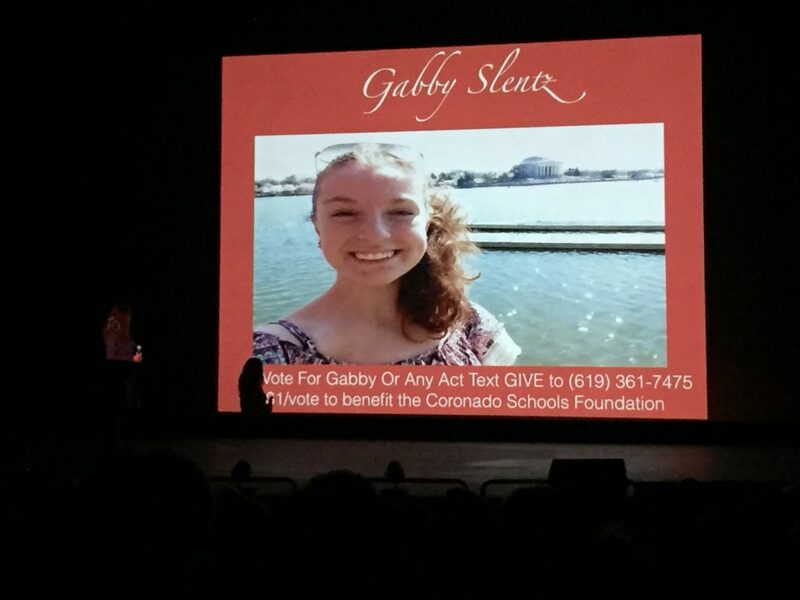 While the final numbers still haven’t been totaled, Kinzel approximates that Coronado’s Got Talent has netted $10,000, all of which will be donated to the Coronado Schools Foundation. While on stage, CSF CEO Patty Cowan praised Kinzel’s hard work. 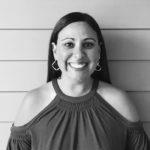 She said that typically people come to CSF with great ideas about how CSF can and should go about raising money, whereas Kinzel came to CSF with an idea about he could create a talent show to raise money for them. Kudos to Kinzel and his team as well as the generous sponsors and prize contributors for uniting the Coronado community at a fun event that showed everyone just how many talented people call this “island” home!